A week ago I was sitting under the North Carolina moon listening to Sam Bush, Derek Trucks, and a host of talented musicians at the 25th anniversary of the Americana music festival Merlefest. What kind of airline doesn’t know where their planes are? Waiting at a United gate for a flight to Chicago that was to leave 10 minutes ago. The gate agents say a plane is being towed from the hangar. I just heard the pilot calling someone asking, “Can you tell me where our plane is? The gate agents don’t seem to know.” Welcome to the Third World. I made my meetings in Chicago (in spite of the plane in hiding) and came back to DC without incident, but tonight seemed to be a very good time to breathe deeply, take it easy, and reflect on Merlefest 2012. 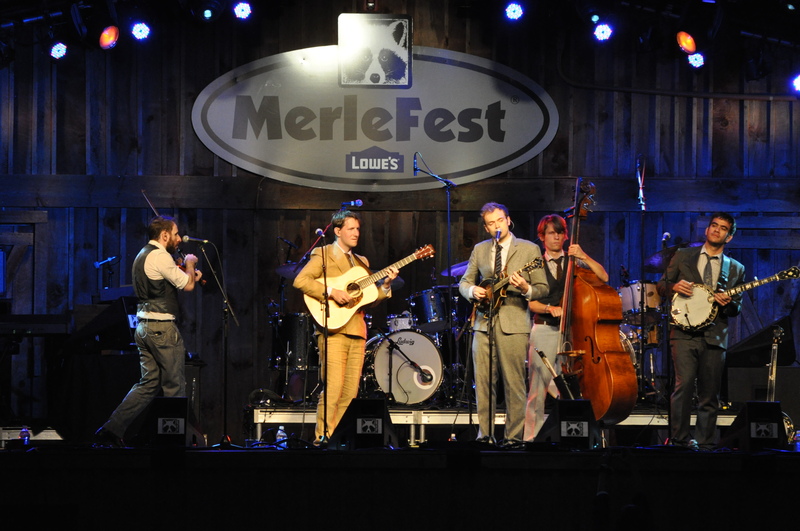 This year was my fifth Merlefest, and it was – by a good measure – the best one of the five. As always happens, I heard bands and musicians who were new to me. I heard old favorites who can still wow a crowd. And I saw some of the best musicians in the country (not just in this genre) playing together in configurations that surprise and delight. 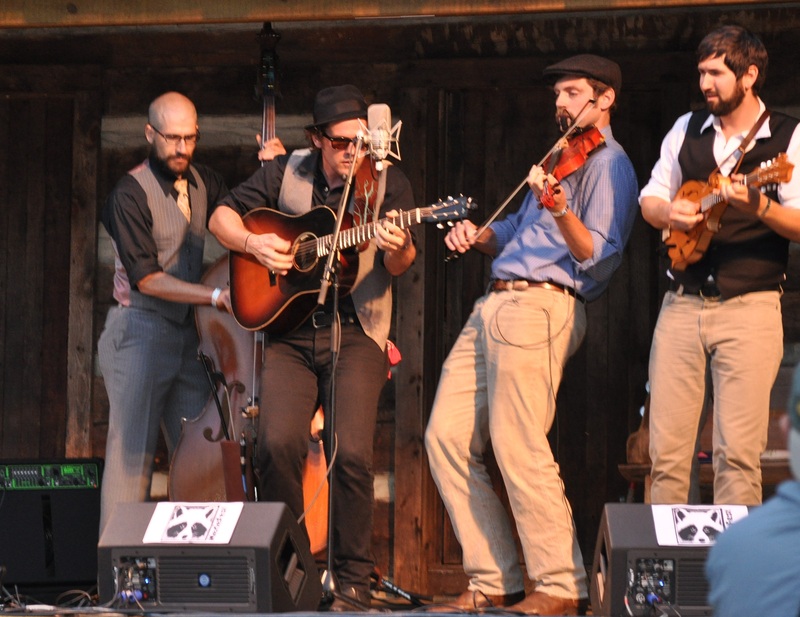 Band that had the best Merlefest: This would be The Steel Wheels (top of post), who took the crowd by surprise on the Cabin Stage on Thursday evening and didn’t let go until they left town after three strong performances to large and appreciative crowds. 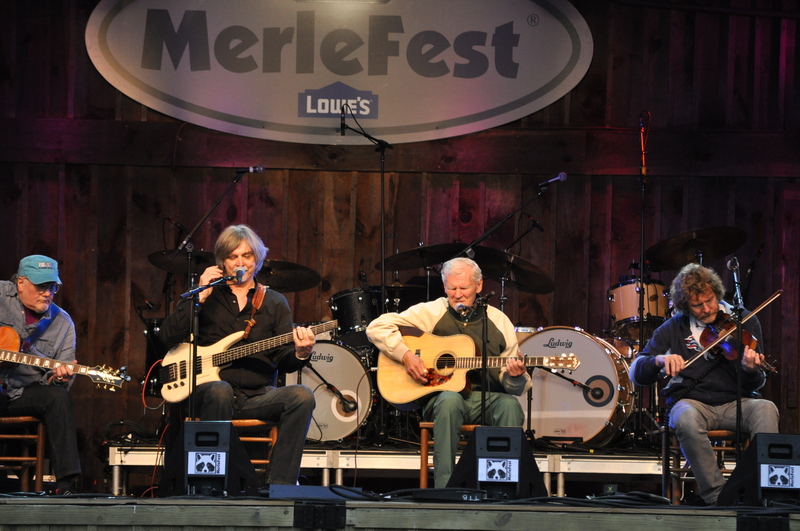 Bittersweet moment: For me, this came when 89-year old Doc Watson – the patriarch of the festival – came on stage Saturday night with long-time collaborators T. Michael Coleman (left of Doc in the picture above) and Sam Bush (on Doc’s right) and other musicians for a celebration. Doc was clearly having trouble keeping up, but he hung in like a trooper. The crowd was showering him with love, while Michael and Sam were keeping a kind eye on the good Doctor. However, when John Cowan sang Don’t That Road Look Rough and Rocky for Doc and his wife Rosa Lee, Doc was visibly moved – which led me and others to shed a tear as well. There will be future Merlefests when Doc’s no longer around, but they won’t be the same. 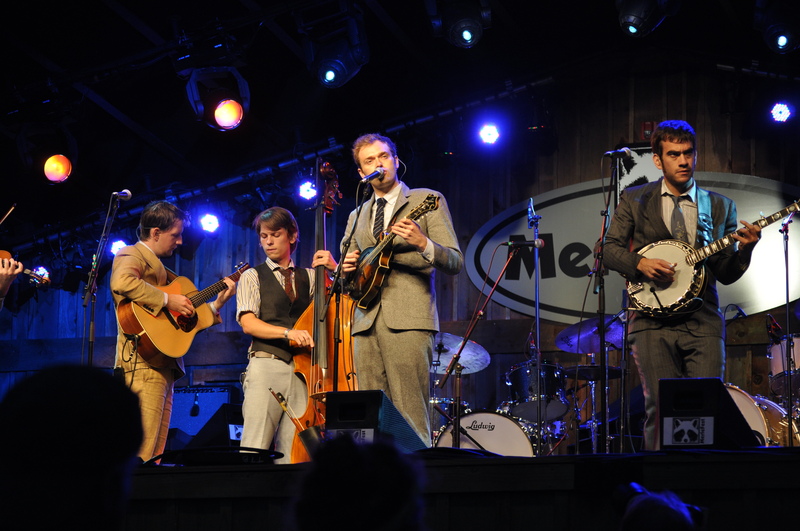 Best jazz quintet masquerading as an acoustic string music band: The Punch Brothers (two photos above) are an incredible ensemble – all strong musicians led by the other-worldly Chris Thile. I don’t pretend to understand all they have going on in their music, but I was more impressed live than I expected. I’ve been among those fans mourning the old Nickel Creek days for Thile, but this is a wonderful band that moves as one. Is there anything they can’t do? 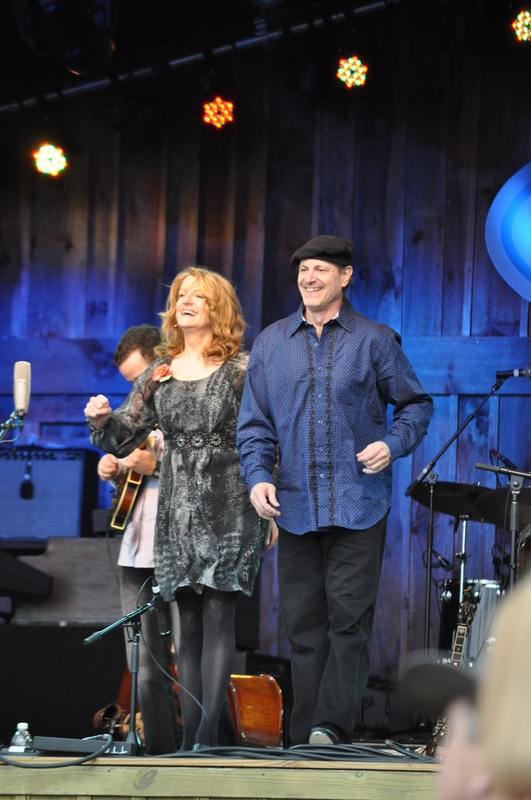 Musician having the most fun: Claire Lynch, shown above dancing with bassist Mark Schatz. Claire’s show started with a bang and she seemed to smile through the entire set. The audience responded with great enthusiasm, and her band – a terrific group of musicians – kept the energy going strong all the way through her traditional closing number, The Wabash Cannonball. Best band reunion: It was great to see the original lineup of Bela Fleck and the Flecktones onstage at Merlefest. 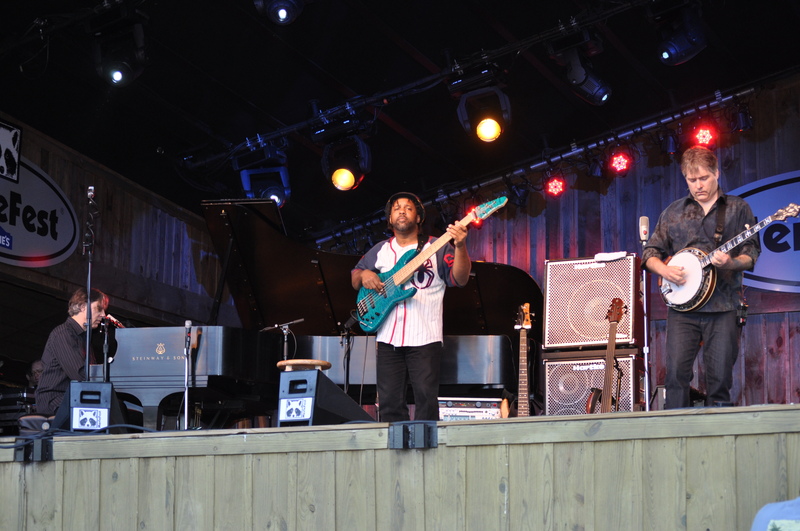 Howard Levy was always a strong component of the early Flecktones sound, and he didn’t disappoint in the reunion set. This was a band that wasn’t focused on the past, but had new material to showcase as well. Best musical moment: Everyone who saw Friday night’s set of the Sam Bush Band was buzzing about it the rest of the weekend. I certainly wrote about it late that evening. Sam and the band had a great opening, but when they brought out Derek Trucks, his wife Susan Tedeschi, John Cowan, and Bela Fleck it was magical. Luckily, there’s a great video of the entire set of three tunes on You Tube. Take a look at Sam Bush’s face at about 2:06 when Trucks plays an amazing lick. That’s how everyone felt.